Please refer to our stock # 5605 when inquiring. 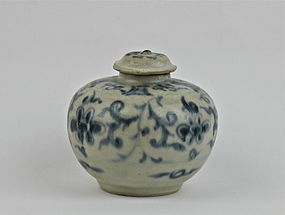 A lovely blue and white jarlet with chrysanthemum design and lid. Vietnam's 15th/16th century, condition is very good, only tiny flake glaze to the body, but overall near perfect. Height maximum: 8cm.